Princess Nokia - A Girl Cried Red. Vinyl EP. Bleep. 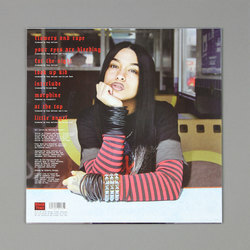 After Rough Trade picked up Princess Nokia for a reissue of her breakout 1992 mixtape back in 2017, we now get the first original material that the NYC star has put out via the indie giant. From the opening strums of acoustic guitar, you get the sense that A Girl Cried Red might be something rather different from what Nokia has given us before. Gone are the trunk-rattling trap and boom-bap sounds of yore. In their place we have a mini-album that is pitched somewhere between Lil Yachty, Lauryn Hill, Charli XCX and Fall Out Boy. That’s right, there are some straight-up Fueled By Ramen-isms here, specifically the grungy singalong ‘Look Up Kid’ and the guitar work that backbones many of the other tunes. As with artists like Yachty, iLoveMakonnen and Rae Sremmurd, Nokia bridges the gap between the worlds of rock and rap here. We’re into it.